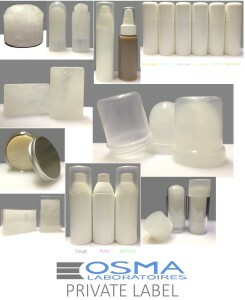 We offer a complete private label catalogue made from our standards alum stones, and cosmetics products that you can label to your own brands. Unpacked alum stones, finished products, we’re abale to adapt our manufacturing process to your request in order to answer to modern responsiveness requirements. Our human sized company, is also the opportunity to offer a personnalized answer to each requests. We offer a large offer of comestic that could benefit of Organic certification and they all asnwer to the current European regulation. We’re also able to bring you all our experience in order to develop your own cosmetic formulas from research and development until answering regulation and market standard. Own packaging, own formual, own perfume, don’t hesitate we can create you a unique cosmetic product taht will fit your customers’ demand. We’ll offer you “ready to sale” products corresponding to your requirements. Don’t hesitate to contact us for any request. Click on the link below to see our private label catalogue.